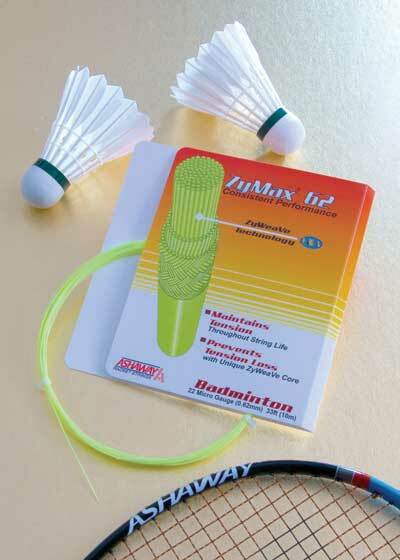 Ashaway, RI — Ashaway Racket Strings has achieved another first with the introduction of its new ZyMax® line of badminton strings. A new core construction technique called ZyWeaVe™ makes the flagship product of the new line, ZyMax 62, the lightest badminton string ever made. The unique ZyWeaVe core construction in ZyMax 62 prevents tension loss while its braided surface provides superior control. The result is exceptional playability and the crisp sound badminton players want to hear. ZyMax 62 maintains tension throughout its life and maximizes repulsion on smashes and drop shots. Ashaway recommends 22 gauge ZyMax 62 be strung at 25 lbs tension for optimum durability and playability. At 25 lbs tension, ZyMax 62 has the same repulsion power as a .70 mm string strung at 30 lbs or more. ZyMax 62 is available in 10m sets and 200m reels.